I have been a big fan of Western Fiction or Frontier Fiction from the time a paternal uncle introduced me to English writer Oliver Strange's Sudden series. I was in my teens and I was hooked. His ten novels and an additional five by Frederick H. Christian (British writer and editor Frederick Nolan) have been featured on this blog a few times. The exploits of James Green, alias Sudden, the Texas outlaw, led to my heightened interest in other western authors, notably Louis L'Amour, J.T. Edson, Zane Grey, Max Brand, George G. Gilman, Wayne D. Overholser, Jonas Ward, Giles A. Lutz and others. I continue to read westerns. Since then, however, I have always dreamed of writing a western novel. There were even a few halfhearted attempts. In August 2015, I began work on a Wild West-comes-to-India novel in earnest. At least, that was the plan. I typed out a few thousand words and was pleased with the way the story was shaping up. It was about a Western-styled Indian sheriff set in an old part of Mumbai in the 21st century. So it had cowboys and gunfights as well as four-wheeler taxis and pizza delivery. 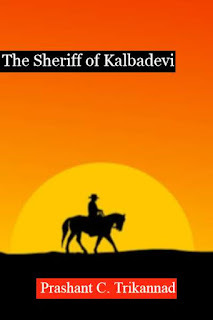 But Procrastination and Distraction, the two nemesis of my writing life, bushwhacked me along the way and that was the end of what I thought would one day be my debut novel called The Sheriff of Kalbadevi. 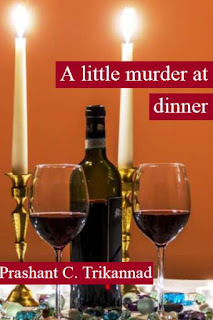 Then, last month, I read about a short story contest at Juggernaut Books, a popular Indian writing platform where I had previously published an atmospheric tale set around a murder mystery, titled A Little Murder at Dinner. I retrieved my western story from the recesses of D drive on my computer, scaled it down to a little over 2,000 words, got the family to proofread the story, and uploaded it on the Juggernaut website. As of writing this post, the results were yet to be announced. The story begins in Kalbadevi, an old neighbourhood of Mumbai named after the Hindu goddess Kalbadevi. The area has an old-world charm and is known for its wholesale markets, usually bustling with activity six days a week. I worked along its periphery for many years. This is how The Sheriff of Kalbadevi begins. Friday night descended on Kalbadevi like any other summer night, the weather still unforgiving. Long after the Indian sun ducked into the Arabian Sea, the old neighbourhood of Mumbai was enveloped in a haze of April heat and dust. Red earth rose and swirled in the air, settled down, and rose again. Kalinga sat hunched on his horse under a yellow streetlight. He blew smoke from a cigarette and looked around him with a sense of boredom. There was little movement on the intersection of Princess Street and JSS Road. Two young cowboys on horseback were riding out, back to their ranch or maybe to the seafront on the other side of town, to meet their girlfriends. A woman hurried across the street with her young son and disappeared round the corner of a dilapidated building. Shopkeepers and roadside hawkers were closing business for the day. A group of weary traders vanished behind a tobacco-stained curtain into a country liquor bar. When they staggered out, they would be men no more. He eyed them with distaste. And here is a significant passage appearing towards the end. The four gunmen stared in disbelief as two six-guns appeared magically in the sheriff's hands and spit fire simultaneously. They didn't stand a chance. His first bullet caught Balki plumb between the eyes. He died instantly and slid to the ground head first. His horse bolted. Two of his sidekicks got a bullet each in the chest and were thrown off their horses. His fourth bullet sliced through the throat of the last man who slumped in his saddle. It was all over in less than a minute. Instantly, a new legend was born and it'd travel miles and miles, just like all of his fabled gunfights of the past. If you're tempted to read the full story, then please click here. I hope you like it. I had fun writing it, partly because it was an original idea. 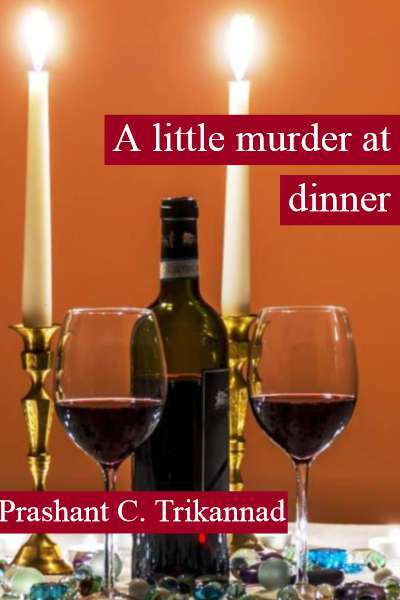 And if you're still around, you may also like to read A Little Murder at Dinner and the related Editor's Pick of the Week interview Juggernaut Books did with me in June this year. Oh, Prashant, I am so happy for you! How exciting that you've taken the leap and written this! What I've read is well-done and intriguing, with a really strong sense of place and context. I look forward to reading the whole story (and your other work, too). Thank you very much, Margot. Your support and your kind words mean much to me. I do wish I'd gone ahead and written a novel out of it as planned. Anyway, I have a few other ideas and ongoing writing projects, and I hope they'll get to the publishing stage by this time next year. Congratulations Prashant. I hope it does well in the competition and regardless of the result, you feel inspired to continue writing. Thank you, Col. The competition was only an opportunity to breathe new life into my story and publish it. I'm currently working on a few projects including two nonfiction. For now, I'm keeping my fingers and toes crossed. Prashant – Glad to hear your story is up on the Web. Which reminds me, I’ve got to try to get on that site again to read your first story. I had some problems accessing it, and my teenager has been away at school, so I did not have my secret weapon in dealing with the digital world. Must try again. Also, I agree with Margot – you paint a vivid picture of the place right off the bat, and then deliver some fast action later. I think you have the makings of a novel here. Writers of the classic pulp era expanded short stories into novels. Thank you very much, Elgin. You can login with your Facebook ID without signing up. The story was meant to be a potential novel but, unfortunately, somewhere along the way I lost track of it. By the time I looked at it again, I already had other projects in the works, and so I decided to turn it into a short story. Well done you, Prashant, this all sounds great. I tried to read your story, but could only access the opening passage, is there any easy way to find the rest. I love the idea of combining India and Westerns! Brilliant. Thank you very much, Moira. I'm glad you liked the idea. As a big fan of Westerns, I always wanted to write something along these lines, of "desi" or native cowboys and gunslingers set in an imaginary Indian Wild West. You can login with your Facebook ID, add it to your bookshelf and read the story. That's wonderful, Moira! I appreciate your positive feedback. Thanks for taking the trouble to login and read it. Prashant, the first few paragraphs sound very good. I can't go further because I am not on Facebook, but I wish you well with your writing. I know it takes perseverance and a lot of work. No problem, Tracy. I'm still testing the waters of fiction writing. I need more discipline and perseverance in my writing than I allow myself currently. I have a few ideas and projects in pipeline. Inspiration! Or, Do You Believe in . . . Ghosts?